Dustin and I are getting married today in the low-key setting of the Ballyvolane House garden near Cork, Ireland. I’ve been asked quite a few times why I chose Ireland…I thought about fibbing and saying Dustin was Irish (the red hair would work in my favor). But the truth is that Dustin is marrying a crazy person. 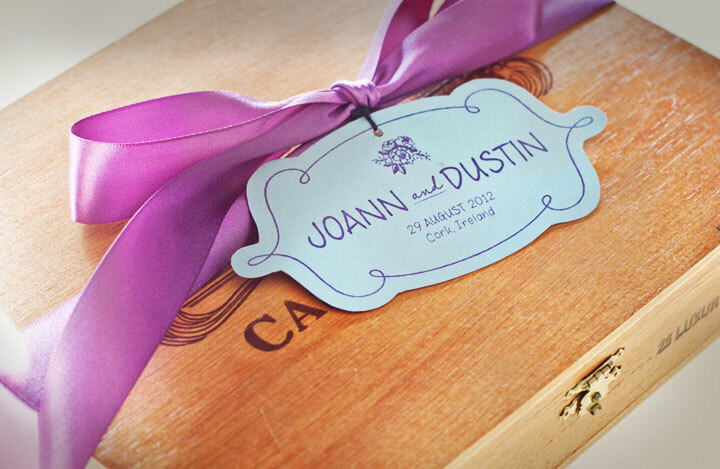 Our immediate family is following us across the Atlantic to be with us on our wedding day, so I really wanted to make them something special from the two of us. My search for ideas started by looking up boxes on Etsy. 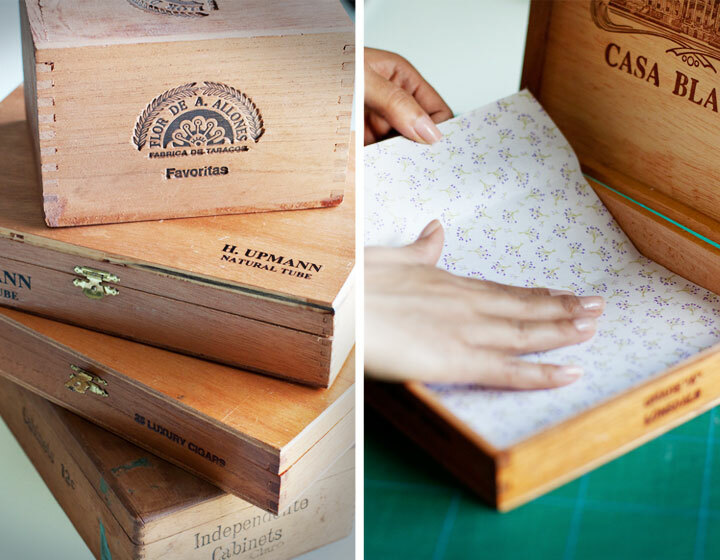 I came across some awesomely textured and weathered cigar boxes. Each box was unique in its own way. I knew I wanted to use them as the basis of my gift. Etsy has been our best friend in this whole process. After finding the boxes, I found fabric to line them to give them a vintage suitcase vibe. I created and hand cut labels for each gift I put into the boxes. If I ever do this process again, perhaps for my sister, I will use simple square labels! 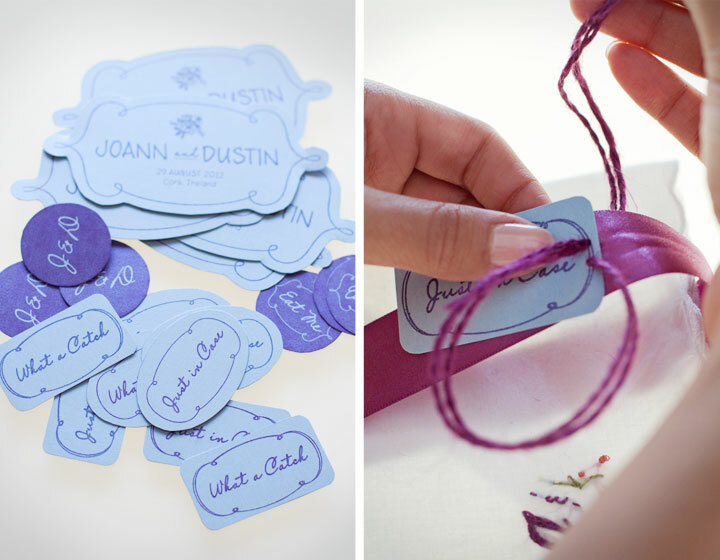 I used a needle and thread to attach the labels to ribbons that I wrapped around each gift. 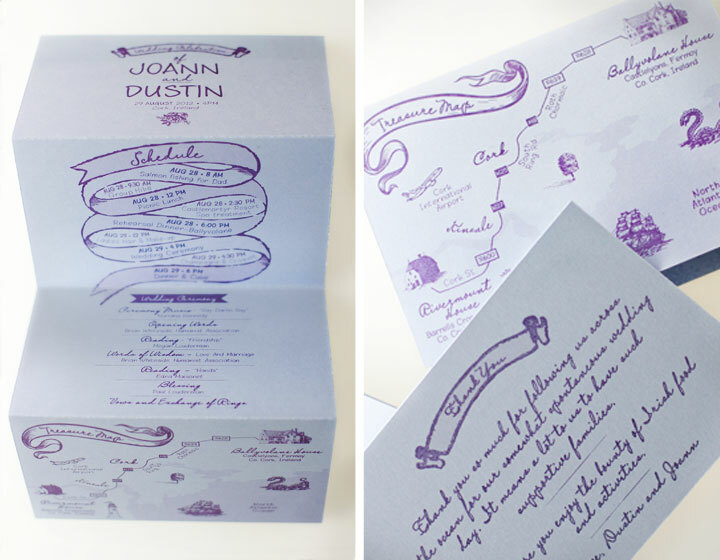 I created stationery with a short activity list and wedding schedule, a medieval map, and a thank you card. Since I only had to put together a few boxes I bought special paper from Neenah Paper. 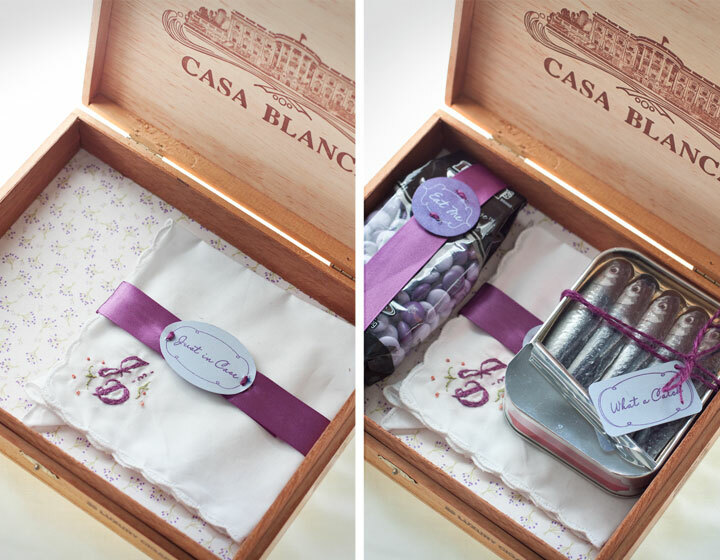 I started with placing a embroidered handkerchief in the gift box with a label that read “Just in Case”. I kept one handkerchief for myself…just in case. Next, I dropped in a bag of M&M’s customized with our initials and an icon of a tree (from a stamp I originally used for our invitations). Finally, I found the cutest little chocolates that look like sardines. My dad plans to go salmon fishing while he’s in Ireland, so it seemed appropriate. 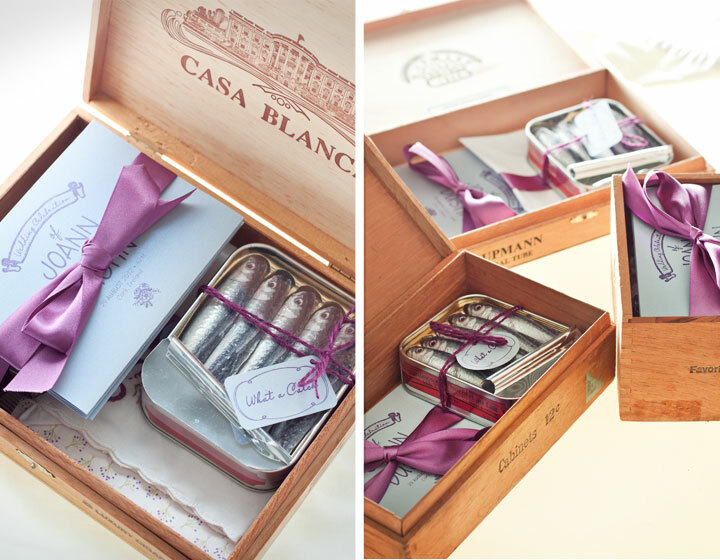 I finished by adding the stationery and closing the boxes with purple ribbons. Special thanks go out to our families for coming all the way to Ireland with us. I also appreciate all the well wishes from our friends and extended family. You will be with us in spirit. The next time we speak, Dustin and I will be married! You are currently viewing the archives for August, 2012 at Chickypea.